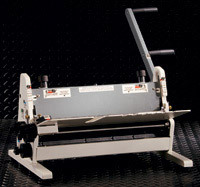 The Rhin-O-Tuff HD 8370 Insert-A-Bind wire inserter/closer mounts to OD 4000, OD 4012, OD 4800, HD 6500, HD 7000 & HD 7700 punches or with Stand Alone Production Feet. It inserts and closes in one easy step, eliminating manual insertion of wire into documents. The HD 8370 is easily adjustable for varying sizes. Insert-A-Bind HD 8370 is shown here mounted on the OD 4012.